A year ago today, my family sat in a small but bright room in the stem cell unit of the Cancer Treatment Center of America in Zion, IL. My mom was in remission from Philadelphia positive, adult, acute lymphoblastic leukemia; and it was day #1 of her two-day stem cell transplant. We knew little about her non-related donor, except that he was a "he", young, and French. So, to take the edge off of such a weighty day, we threw a French "mustache" RE-birthday party - after all, this was going to be mom's second chance at life, we had to celebrate it! 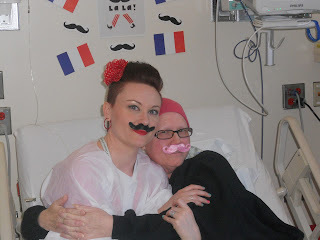 Mom and I during her French "mustache" transplant party, May 24th, 2012. Today, a year later, I sit in front of my computer, in my small office in my house in Branson, MO...missing my mom like crazy and crying like a little girl. Every major holiday or event that has occurred since mom passed on March 7th of this year, I have thought that I needed to write something here - Easter, my son's baby shower, Mother's Day, my 32nd birthday...but I just couldn't. Even now, the words spill out dead and meaningless...nothing is enough, nothing is adequate, nothing will ever be right again. I cannot describe to you right now how sad I feel most every day, but the worst is knowing that I have lost my mother when I myself am FINALLY on the cusp of becoming a mother myself. It breaks my heart. And it really hurts knowing that my son will never know his grandmother here on earth - she would have been the BEST! She felt such a kindred connection to him since she was also adopted, and she had so many plans for life with him. There is nothing left for me to say here...I'm just not ready, but I want to thank those who have stopped by to check in on me. I appreciate knowing that someone out there cares. And, hopefully, in the near future, I'll be able to write more or at least have something more eloquent to say - my mom deserves that much. Mandie, I've been thinking of you and your family, wondering how you're all doing. I'm so very sorry to read this news. I feel that I got to know your wonderful mother through this blog and I was amazed and inspired by her strength and optimism. My heart is breaking for you. Oh Mandie, I am so very, very sorry for your immense loss. Your mom was an inspiration - she fought her battle with such grace and strength. I am at a loss for words. Know that you will be in my thoughts and that when you're ready, we'll be here waiting. Hugs to you and your family. Thanks, ladies. I am heart-broken, yet so happy that she is no longer suffering or in pain. I know she is experiencing the best restoration possible...but I am still hurt she is not here with us. I appreciate your kind words and support. Angela: I'm so sorry about your dad. It is awful losing someone you love; and I wish that no one had to endure it. Love and prayers to you and yours as well! Anonymous: I am so sorry about losing your dad after transplant. I know first-hand how disappointing that is. They have gotten so far and endured so much just to get to transplant - it seems inconceivable that they could pass after getting to that all-important step. My heart goes out to you and your family. Love and ((HUGS))! My heart hurts for you and I think of you and your sisters often. I have known your Mom a big chunk of my life! I wanted you to know (not that you need validation from anyone)that what you feel and how you feel is perfectly ok! I too lost my Mom at a very important part of my life. My daughter was only 3 and my son had not yet been born. I so wanted my mom and to this day (and it has been 15 years) I still want my mom. But what I can share is that it gets different over time and as my daughter (who will be 18 tomorrow) reminds me, "Momma, just remember Nana and Papa are getting to see everything first hand and aren't missing a thing!" Losing a parent is one of the hardest things in the world, especially since we still have our whole lives ahead of us. I will share with you that having my son 2 years after my Mom died was a blessing for my Daddy. He did not have any sons of his own, my son was exactly what he needed and help him through managing his loss. I have since lost him too and he was my best friend and I still miss him like crazy. So many times on my drive to work I think I need to call Daddy and tell him this or that. I used to call him every morning at the same time on my way to work. I don't have magic words, but wanted you to know that I completely understand where you are coming from and understand. I wasn't exceptionally close to my mom, but our relationship was just starting to turn because I had become a Mom so I understood better than I had ever before some of things and the choices that were made. You are right, your Mom would have been such a natural at being a Grandma. But as my Rachel says she will see everything and experience your son from Heaven. Just tell him all about her and show her pictures. I would sometimes find Daddy talking about "Nana" to Isaac and it was just the sweetest thing ever! I hope that you find some comfort in knowing that others understand what you are going through and how you feel. Sending many hugs to you (and your entire family; Tell your Grandma Carol I send my love)! You all continue to be in my thoughts and prayers! Hugs and Love from Kentucky!